Recently, well, in 2018, I started using hedges for my credit spreads. I wasn’t using hedging much in the past because I wasn’t sure how to use them properly and how to manage them. So I avoided them. Thus 2018 year was somewhat revolutionary to my trading as I learned using them. So the old options wolves will be probably laughing at me right now sharing something what was very obvious to them… but not always to me. And apparently, not all traders are able or know how to use hedging. 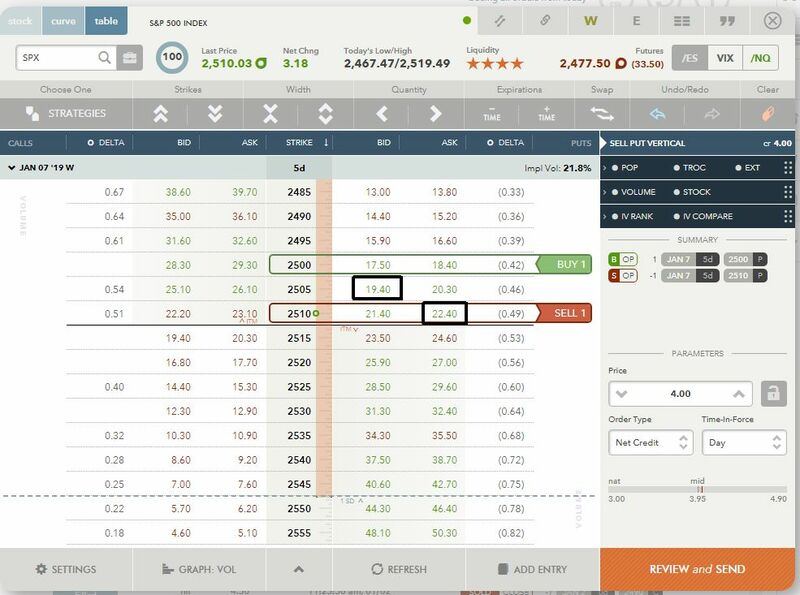 To me, as I mentioned in my previous post, I was afraid that by opening a hedge, which is a debit trade, I can lose money in a decaying instrument such as options and it cannot be repaired. I was wrong. One reason I am no longer afraid of debit spreads is my recently discovered way how to salvage a trade. I briefly mentioned it in my previous post but I think I need to ad some visual explanation. As you can see, this hedge would cost me $2.25 debit. If I am correct and my existing credit spread (not shown on the above example) really gets in the money, then I will be able to close the new debit spread for approx. $4.50 credit making a nice profit of $2.25 dollars. On the other hand, the credit spread will also be in the money but due to a time value still left in the spread I can close such spread for around $3.00 a contract. In this case, my loss is only $0.75 per contract instead of a full $3.00 loss. I would gladly take $75 dollars loss over $300 dollar loss. But when I see the market really falling I usually open more than one debit trade so my collected credit is larger and offsets more losses. Of course, the point here is not to wait until the existing credit spread is in full loss (which would happen at expiration). But what if I am wrong and the market starts rallying again? And here is what I like with those debit spreads. If I am wrong and the market reverses and starts rallying, I can convert the debit spread into a credit spread. Of course, this adds risk to the account and it consumes buying power, so you need money to be able to trade this. But I like it and I like to play it this way. If the market starts moving up fast and strong, I roll the short strike. If however, rolling a short strike would result rolling it into money, then I decide to roll the long strike. This depends on how confident I am with the market move, how much time is left, etc. In the above example, let’s say the market goes up and shows strength and I do not have too much time to expiration. So I decided to roll the long strike down by selling the existing 2510 long strike and buying a cheaper lower 2500 long strike. In the example I would collect about $4.00 credit making it already a profitable trade. Of course in the real life this would result possibly in a lesser credit, possibly around $3.80-ish level. So for the sake of this example, let’s use $3.80 credit. 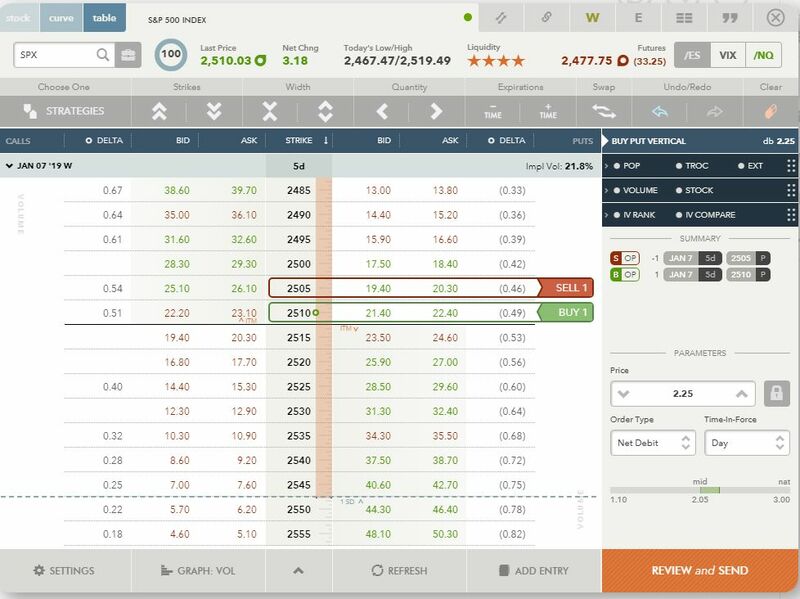 In this example, the overall trade balance would be $1.55 credit. Risk would be $3.45 which would also be your buying power requirement. If I am right with this adjustment, then I can close the trade for 0.10 or 0.05 debit and be out with a profit. So no matter what, if played well, these adjustments can help minimize losses or make a profit. It is almost a win-win situation. But, what if I am wrong again? And in today’s market it is quite often. Let’s say I convert a debit trade into a credit trade and the market starts falling again (like today). Then I use a butterfly to protect the new trade. In this case I place back the original debit spread. Now I would have 1 lower long put contract, 2 short put contracts and 1 higher long put contract. Overall loss would be -1.50 debit if we do nothing. Still better than a full loss of $425 dollars if we let the original credit trade end in the money at expiration. I usually wait for this to play out and if I see the market keep falling then I most often close the debit part of the trade for larger credit, for example $4.50 credit and open a new one lower than the original credit trade. That would cost +/- $2.20 debit again but if the market keeps falling than I would be able to close it again for a profit and the collected credit would allow me to roll the old credit into the next expiration and convert into call spread or roll into put spread and lower (and I usually add a credit call spread converting into Iron Condor. 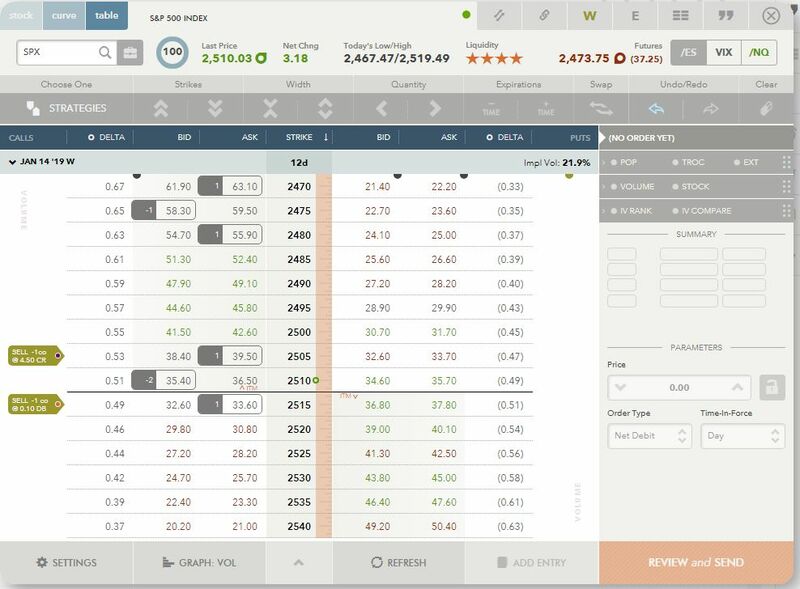 As of now I am able to liquidate bad trades with minimal loss or even with profit but I am still playing with these adjustments to see how else I can improve those adjustments to preserve capital more and eliminate bad trades without a big damage I endured in January 2018 when I decided to close my bad trades at TD account because I didn’t know how else I could salvage those trades. Now I kinda know. Of course, I do these trades in short expiration trades only and as a hedge trades. I do not use them as a main mean of profit as I do not feel very comfortable to trade it for a profit and I do not want to keep opening trades and reversing them back and forth. But that may change too in the near future. So far, I am happy with the results. Instead of rolling bad trades into future, I can keep closing them for minimal to no loss. Some of my followers told me in the recent past that I have deviated from my strategy of trading puts and calls using stocks as underlying security and that I now trade SPX only, which is not why they followed me in the first place. Yes, I must admit that lately (pretty much the entire 2018 year) I was trading SPX exclusively. But that was not because I abandoned stocks. The reason was a more pragmatic one. When the market slumped in January – February 2018 some of my stock positions got immediately assigned and I collected a full loss on those positions. Even today, I got assigned to a stock position which had expiration 172 days from now (!!!) that is almost six months from now! And yet I got assigned. Who in their right mind would ever assign a stock with so long expiration away? If long DTE cannot protect me from early assignments, then I do not want to be in American style options for now. To avoid early assignments I decided to convert those trades into SPX trades. That means I closed in the money stock trades and opened equal SPX trades. 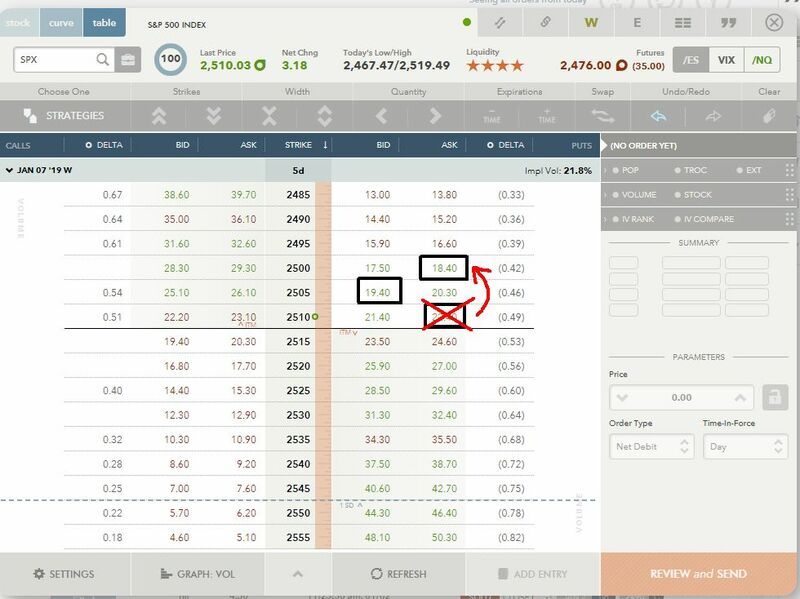 They were equal in the buying power requirement, expiration, and collected credit completely offset the debit needed to close those stock option trades. So it was literally a one to one swap. Now I can sit on those trade until the last 5 minutes to the expiration without being worried of early assignment and I have a plenty of time to decide what to do next. And with the new debit spreads strategy it seems I can be unwinding those trades without big losses. Once the market calms down and decides on a direction it wants to go, I will most likely return back to trading stocks again. But it is too risky as of today.